highly simplified preventative maintenance of heat exchangers and, most importantly: automated! Thanks to its fully automated controls, you can use the automated integrity test yourself easily and, most importantly, with adherence to highest levels of safety. 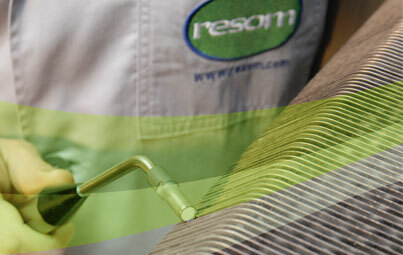 resom stands for practical, efficiency-increasing solutions. In order to create new product safety possibilities for industries such as the food industry, our R&D team has developed a state-of-the-art system allowing for a heavily simplified preventative maintenance of heat exchangers: the fully automated integrity tester HLD600 automatic. This system thus allows for the early identification of damages and micro-biological problems, prevention and thus preclusion of follow-up costs caused by unexpected production stops, repairs, product recalls etc. The resulting tremendous cost-saving potential as well as its simplicity and user safety are among the major advantages of this new method for the automated state examination. Improve your preventive maintenance now with the HLD600 automatic integrity tester! 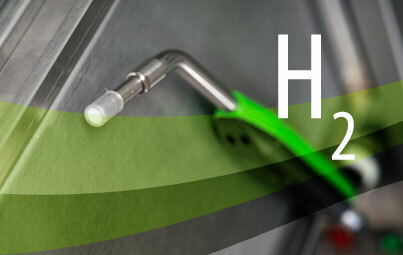 resom has recognised the benefits of hydrogen as an optimum basis for high-performance integrity tests and implemented this in the form of the most technically advanced and physically safest methods available on the market: Our highly sensitive hydrogen leak indicator detects the diffusion of H2 molecules through metal and thus specifically identifies material fatigue and defective seals which allows for immediate corrective action. Using this preventative heat exchanger inspection method, one can prevent damages such as the dreaded micro-biological contamination caused by product cross-contamination at an early stage. Regular heat exchanger inspection safeguards the purity of your products in the long run and guarantees highest possible standards of hygiene. We offer two options for straight-forward gas tests: Depending on your requirements, our specialists either perform our hydrogen leak detection directly at your location or create a tailor-made purchase option for you. Thanks to its fully automated controls, you can use the automated leak test yourself easily and, most importantly, with adherence to highest levels of safety. The HLD 600 automatic's operation is easy and intuitive and thanks to its compact construction, it can be used even in difficult to reach places. Highest levels of product purity and quality are of primary importance, particularly in such industries as the beverage, food and pharmaceutical industry. The HLD 600 automatic's integrated software supports you in implementing your quality management routine by providing comprehensive test reports which are created during every measurement operation. You can view all relevant data at a glance and thus safeguard full documentation. The performance and safety of your production are of utmost important to us. As a renowned specialist, we utilise synergies and – besides our fully automated integrity test – offer possibilities of precisely measuring pressure surges as well as our pulsation damper, an in-house development. Why wait for damages and micro-biological problems if they can be prevented in advance by means of adequate integrated maintenance? Use the tailor-made possibilities resom can develop for your production process.